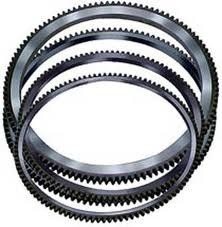 We are a leading Manufacturer of flywheel rings from Delhi, India. Flywheel Rings are one of the most important and needed equipments for a wide range of industrial works regarding steering systems. These flywheel rings are used for the installation in the flywheels which are further used for the purpose of rotation and revolutions of the main axles and the studs related to different industrial applications. Our company has manufactured these flywheel rings using very tough and tensile quality raw materials and is offering them to its clients at a very attractive range of prices. Looking for Flywheel Rings ?